For the song, see Den Pobedy. For other uses, see V Day. For the list of all parades celebrated throughout history, see Victory Day Parades (9 May). Victory Day[a 1] is a holiday that commemorates the surrender of Nazis in 1945. It was first inaugurated in the 15 republics of the Soviet Union, following the signing of the German Instrument of Surrender late in the evening on 8 May 1945 (after midnight, thus on 9 May Moscow Time). The Soviet government announced the victory early on 9 May after the signing ceremony in Berlin. Though the official inauguration occurred in 1945 the holiday became a non-labour day only in 1965 and only in certain Soviet republics. In East Germany, 8 May was observed as Liberation Day from 1950 to 1966, and was celebrated again on the 40th anniversary in 1985. In 1975, a Soviet-style "Victory Day" was celebrated on 9 May. Since 2002, the German state of Mecklenburg-Vorpommern has observed a commemoration day known as the Day of Liberation from National Socialism, and the End of the Second World War. The German Instrument of Surrender was signed twice. Initially, it was signed in Reims on 7 May 1945 by Alfred Jodl (chief of staff of the German OKW) for Germany, Walter Bedell Smith, on behalf of the Supreme Commander of the Allied Expeditionary Force, and Ivan Susloparov, on behalf of the Soviet High Command, in the presence of French Major-General François Sevez as the official witness. Since the Soviet High Command was not informed about the surrender, and because Susloparov, a relatively low-ranking officer, was not authorized to sign this document, the USSR requested that a second instrument of surrender be signed in Berlin. Joseph Stalin declared that the Soviet Union considered the Reims surrender a preliminary document, and Eisenhower immediately agreed with that. Another argument was that some German troops considered the Reims instrument of surrender as a surrender to the Western Allies only, and fighting continued in the East, especially in Prague. [Quoting Stalin:] Today, in Reims, Germans signed the preliminary act on an unconditional surrender. The main contribution, however, was done by Soviet people and not by the Allies, therefore the capitulation must be signed in front of the Supreme Command of all countries of the anti-Hitler coalition, and not only in front of the Supreme Command of Allied Forces. Moreover, I disagree that the surrender was not signed in Berlin, which was the center of Nazi aggression. We agreed with the Allies to consider the Reims protocol as preliminary. A second surrender ceremony was organized in a surviving manor in the outskirts of Berlin late on 8 May, when it was already 9 May in Moscow due to the difference in time zones. Field-Marshal Wilhelm Keitel, chief of OKW, signed a final German Instrument of Surrender, which was also signed by Marshal Georgy Zhukov, on behalf of the Supreme High Command of the Red Army, and Air Chief Marshal Arthur Tedder, on behalf of the Allied Expeditionary Force, in the presence of General Carl Spaatz and General Jean de Lattre de Tassigny, as witnesses. The surrender was signed in the Soviet Army headquarters in Berlin-Karlshorst. Both English and Russian versions of the instrument of surrender signed in Berlin were considered authentic texts. The text of the instrument of surrender explicitly stipulated complete disarmament of all German military forces and handing over all weapons. Both the Reims and Berlin instruments of surrender stipulated that forces under German control to cease active operations at 23:01 hours CET on 8 May 1945. However, due to the difference in Central European and Moscow time zones, the end of war is celebrated on 9 May in the USSR and most post-Soviet countries. To commemorate the victory in the war, the ceremonial Moscow Victory Parade was held in the Soviet capital on 24 June 1945. During the Soviet Union's existence, 9 May was celebrated throughout the USSR and in the countries of the Eastern Bloc. Though the holiday was introduced in many Soviet republics between 1946 and 1950, it only became a non-labour day in the Ukrainian SSR in 1963 and the Russian SFSR in 1965. In the Russian SFSR a weekday off (usually a Monday) was given if 9 May fell on a Saturday or Sunday. The celebration of Victory Day continued during subsequent years. 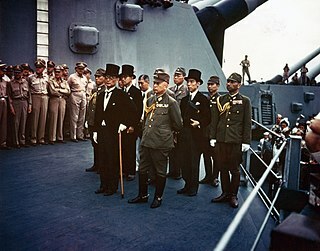 The war became a topic of great importance in cinema, literature, history lessons at school, the mass media, and the arts. The ritual of the celebration gradually obtained a distinctive character with a number of similar elements: ceremonial meetings, speeches, lectures, receptions and fireworks. In Russia during the 1990s, the 9 May holiday was not celebrated with large Soviet-style mass demonstrations due to the policies of successive Russian governments. Following Vladimir Putin's rise to power, the Russian government began promoting the prestige of the governing regime and history, and national holidays and commemorations became a source of national self-esteem. Victory Day in Russia has increasingly become a celebration in which popular culture plays a central role. 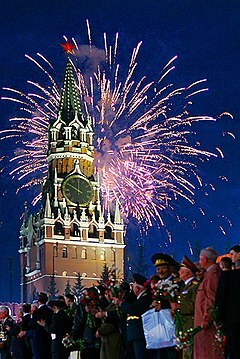 The 60th and 70th anniversaries of Victory Day in Russia (2005 and 2015) became the largest popular holidays since the collapse of the Soviet Union. In 2015 around 30 leaders, including those of China and India, attended the 2015 celebration, while Western leaders boycotted the ceremonies because of the Russian military intervention in Ukraine. 2005 Victory Day parade on Moscow's Red Square. 2015 Victory Day parade on Moscow's Red Square. Armenia has officially recognized 9 May since its independence in 1991. The holiday was similarly celebrated there while the country was part of the Soviet Union. Azerbaijan has officially recognized 9 May since its independence in 1991. The holiday was similarly celebrated there while the country was part of the Soviet Union. A wreath laying ceremony is usually held at the monument to Hazi Aslanov. Belarus has officially recognized 9 May since its independence in 1991 and considers it a non-working day. The holiday was similarly celebrated there while the country was part of the Soviet Union. Belarus has had 2 Victory Day Parades on Masherov Avenue (1995, 2005, 2010, and 2015) and has had an annual ceremony on Victory Square since independence. Bulgaria had officially recognized 9 May during its existence as a satellite state of the Soviet Union. Due to its long historic ties, both the Bulgarians and Russians in the country celebrate both Europe Day and Victory Day ever since. Bosnia and Herzegovina has officially recognized 9 May since its independence. However, it is not a working day only in Republic of Srpska. Estonia does not officially recognize 9 May as a holiday due to its occupational past, although the Russian community still informally celebrate the holiday. The holiday was similarly celebrated there while the country was part of the Soviet Union. Georgia has officially recognized 9 May since its independence in 1991. The holiday was similarly celebrated there while the country was part of the Soviet Union. German Democratic Republic recognized Tag der Befreiung (Day of liberation) on 8 May, it was celebrated as a public holiday from 1950 to 1966, and on the 40th anniversary in 1985. Only in 1975 the official holiday was 9 May instead and that year called Tag des Sieges (Victory Day). Federal Republic of Germany does not officially recognize 9 May as a holiday. However, informal celebrations continue to take place in some areas of the former German Democratic Republic. Also, on 8 May, the German state of Mecklenburg-Vorpommern since 2002 has recognised a commemorative day Tag der Befreiung vom Nationalsozialismus und der Beendigung des 2. Weltkrieges (Day of Liberation from National Socialism, and the End of the Second World War). In Israel, Victory Day on 9 May has historically been celebrated as an unofficial national remembrance day. However, in 2017, Victory in Europe Day (Israel) was upgraded to the status of an official national holiday day of commemoration by the Knesset, with schools and businesses operating as usual. As a result of immigration of many Red Army veterans, Israel now hosts the largest and most extensive Victory Day celebrations outside the former Soviet Union. 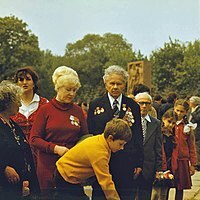 Traditions and customs of Victory Day are the same as in Russia, with marches of Immortal Regiments held in cities with large populations of Red Army veterans and their descendants. Kazakhstan has officially recognized 9 May since its independence in 1991. It's a non-working day. The holiday is sometimes celebrated in connection with the Defender of the Fatherland Day holiday on 7 May. From 1947 the holiday was similarly celebrated there while the country was part of the Soviet Union. 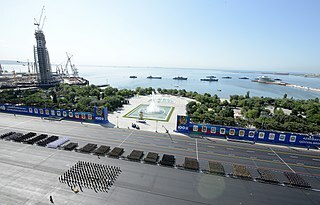 In 1995 the first military parade of Kazakhstan was held on the occasion of the 50th anniversary of the victory day in Almaty. Kyrgyzstan has officially recognised 9 May since its independence in 1991. The holiday was similarly celebrated there while the country was part of the Soviet Union. Latvia does not officially recognize 9 May as a holiday due to its occupational past, although the Russian community still informally celebrate the holiday, especially at the Victory Memorial to Soviet Army in Riga. The holiday was similarly celebrated there while the country was part of the Soviet Union. Lithuania does not officially recognize 9 May as a holiday due to its occupational past, although the Russian community still informally celebrate the holiday. The holiday was similarly celebrated there while the country was part of the Soviet Union. Moldova has officially recognised 9 May since its independence in 1990. From 1951 the holiday was similarly celebrated there while the country was part of the Soviet Union. Mongolia had officially recognized 9 May during its existence as a satellite state of the Soviet Union. The holiday continues to be celebrated unofficially throughout the country. Montenegro officially recognised 9 May as the Victory Day over Fascism as an official holiday. Poland officially recognised 9 May from 1945 until 2014. From 24 April 2015 Poland officially recognised 8 May as "Narodowy Dzień Zwycięstwa" – "National Victory Day". The Russian minority in Poland continues to celebrate 9 May traditions to this date. This holiday was also similarly celebrated there while the country was a satellite state of the Soviet Union. Russian Federation has officially recognised 9 May since its formation in 1991 and considers it a non-working day even if it falls on a weekend (in which case any following Monday will be non-working); The holiday was similarly celebrated there while the country was part of the Soviet Union. Serbia celebrates 9 May as the Victory Day over Fascism but it's a working holiday. Still many people gather to mark the anniversary with the war veterans, including Serbian army, Minister of Defense and the President. Soviet Union officially recognised 9 May from 1946 until its dissolution in 1991. It became a non-labour holiday in 1965. Tajikistan has officially recognised 9 May since its independence following the dissolution of the Soviet Union. The holiday was similarly celebrated there while the country was part of the Soviet Union. Turkmenistan has officially recognised 9 May since its independence in 1991. The holiday was similarly celebrated there while the country was part of the Soviet Union. Ukraine officially recognised 9 May from its independence in 1991 until 2013, where it was a non-working day. If it fell on a weekend the following Monday was non-working. The holiday was similarly celebrated there while the country was part of the Soviet Union. As of 2015, Ukraine officially celebrates Victory Day over Nazism in World War II on 9 May, per a decree of parliament. Additionally the term "Great Patriotic War" as a reference was replaced with "Second World War" in all Ukrainian legislation. Since 15 May 2015 Communist and Nazi symbols are prohibited in Ukraine. Before 15 May 2015, Ukraine held military parades in the capital on Khreshchatyk in 1995, 2001, 2010, and 2011, and 2013. Uzbekistan has officially recognised 9 May from 2 March 1999, where the holiday was introduced as "Memorial/Remembrance Day". The holiday was also celebrated there while the country was part of the Soviet Union. Veterans during a Victory Day Parade in Kiev, 2011. Abkhazia has officially recognised 9 May even since the Russo-Georgian War in 2008. The holiday was similarly celebrated there while the country was part of the Soviet Union. Donetsk People's Republic has officially recognised 9 May following its declaration of independence in 2014. The holiday was similarly celebrated there while the territory was part of the Soviet Union and (after 1991) part of Ukraine. Luhansk People's Republic has officially recognised 9 May following its declaration of independence in 2014. The holiday was similarly celebrated there while the country was part of the Soviet Union and (after 1991) part of Ukraine. South Ossetia has officially recognised 9 May even since the Russo-Georgian War in 2008. The holiday was similarly celebrated there while the country was part of the Soviet Union. Transnistria has officially recognised 9 May since its declaration of independence in 1990. From 1951 the holiday was similarly celebrated there while the country was part of the Soviet Union. Russophone populations in many countries celebrate the holiday regardless of its local status, organize public gatherings and even parades on this day. Some multilanguage broadcasting television chains translate the "Victory speech" of the Russian president and the parade on Red Square. RT also broadcasts the parade featuring live commentary, and also airs yet another highlight of the day – the Minute of Silence at 6:55pm MST, a tradition dating back to 1965. 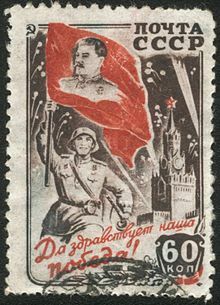 Soviet stamp, 1945. The inscription on the bottom written in cursive, below the Soviet soldier waving the red flag with Joseph Stalin on it, says, "Long live our victory!" Celebrations at the Mother Armenia monument in Yerevan. President Ilham Aliyev with war veterans. The victory parade in Minsk. Belarusian WWII veterans at an independence day parade in Minsk. A T-72 tank during a Victory Day parade in 2015. A victory day parade in Bishkek in 2015. A soldier during a parade on Red Square in 2017. A parade in Sukhumi, Abkhazia. South Ossetian troops at the victory day parade in 2018. Victory day in Tiraspol, 2017. ^ There were 15 republics in the USSR on 8 May 1945. The Karelo-Finnish SSR was abolished in 1956. ^ "Gesetz über Sonn- und Feiertage des Landes Mecklenburg-Vorpommern". Mv.juris.de. Archived from the original on 20 June 2012. Retrieved 15 July 2012. ^ Zhukov, Georgy (2002). Memoirs (in Russian). Olma-Press. p. 329. ^ a b Ločmele, K.; Procevska, O.; Zelče, V. (2011). Muižnieks, Nils, ed. "Celebrations, Commemorative Dates and Related Rituals: Soviet Experience, its Transformation and Contemporary Victory Day Celebrations in Russia and Latvia" (PDF). The Geopolitics of History in Latvian-Russian Relations. Riga: Academic Press of the University of Latvia. Retrieved 7 August 2011. ^ Soldatkin, Vladimir; Stubbs, Jack; Heritage, Timothy (2015-05-09). "Russia stages WW2 victory parade as Ukraine bristles". Reuters. Retrieved 2016-05-09. ^ Parfitt, Tom (2015-05-09). "Russia's Victory Day Parade marks new East-West divide". The Daily Telegraph. Retrieved 2016-05-09. ^ Anon. "Victory and Peace Day: May 9". Holidays around the world. A Global World. Retrieved 9 May 2015. ^ Anon. "Victory Day Observed in Azerbaijan". Holidays around the world. A global world. Retrieved 9 May 2015. ^ Israel passed the law on 26 July 2017. ^ "Военные парады в Казахстане за 15 лет "подорожали" в одиннадцать раз". Radiotochka.kz | Новости Казахстана – события, мнения, аналитика. Retrieved 2017-09-22. ^ "Thousands mark Soviet Victory Day in Riga". Public Broadcasting of Latvia. 9 May 2015. Retrieved 9 May 2015. ^ "Crowds mark Soviet 'Victory Day' in Rīga". Public Broadcasting of Latvia. 9 May 2018. Retrieved 9 May 2018. ^ "Mamy nowe święto państwowe. Po raz pierwszy obchodzimy Narodowy Dzień Zwycięstwa"
^ Anon. "For Russia 70th WWII anniversary looms large". Russia behind the headlines. RBTH network. Retrieved 9 May 2015. ^ Lviv Oblast, however, does not recognize Victory Day, but rather recognizes the day as a memorial to all wartime victims of both the Soviet and Nazi regimes, as well as all of those caught in between. ^ "Their memory lives on". Ut.uz. Archived from the original on 16 May 2012. Retrieved 15 July 2012. ^ "Estonia: Local Russians Celebrate End Of World War II". Radio Free Europe/Radio Liberty. 9 May 2007. Archived from the original on 13 May 2014. Retrieved 19 April 2015. ^ В Канаде прошли праздничные мероприятия, посвященные Дню Победы [Russian Orthodox Church in Toronto celebrates Victory Day]. Mospat.ru (in Russian). 8 May 2005. Archived from the original on 28 September 2011. Retrieved 15 July 2012. Wikimedia Commons has media related to Victory Day (Russia) and Victory Day in Ukraine. Several nations observe or have observed a Navy Day to recognize their navy. Võidupüha or Victory Day in English is a Public holiday in Estonia which takes on June 23. It has been celebrated since 1934. The holiday marks the victory of Estonia in the Battle of Cēsis by the Baltische Landeswehr on June 23, 1919. Independence Day of Ukraine is the main state holiday in modern Ukraine, celebrated on 24 August in commemoration of the Declaration of Independence of 1991.
International Workers' Day, also known as Workers' Day, May Day or Labour Day in some countries and often referred to as May Day, is a celebration of labourers and the working classes that is promoted by the international labour movement which occurs every year on May Day, an ancient European spring festival. Independence Day of the Republic of Belarus, also known as Republic Day or Liberation Day is a public holiday, the independence day of Belarus and is celebrated each year on July 3. Independence Day of Tajikistan is the main national holiday of the Republic of Tajikistan. Defender of Ukraine Day is a state holiday in Ukraine celebrated annually on 14 October. Its first celebration was in 2015. Starting from 2015, this day is considered a public holiday. The Chișinău Independence Day Parade is one of the events of the Independence Day of Moldova. The parade is held in Chișinău, Moldova on August 27 every 5 to 10 years on Great National Assembly Square. The Independence Day of South Ossetia is the main state holiday in the partially recognized Republic of South Ossetia. This date is celebrated on September 20. It commemorates South Ossetia's declaration of independence from the Georgian SSR in 1990, and the country's recognition as a sovereign state by Russia in 2008. Victory Day Parades are celebrated on the 9th of May in various post-soviet nations, primarily Russia, Kazakhstan, Belarus, and formerly Ukraine. The Ukrainian government in 2015 had renamed the holiday as "Victory Day over Nazism in World War II" as part of decommunization laws, but even after the change a vast amount of the populous still honors Ukrainian-Soviet troops who fought in World War 2 in the traditional Victory Day style.